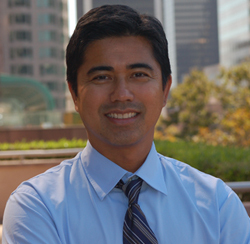 Dr. Don Mungcal is a Dentist from Los Angeles who specializes in Cosmetic Dentistry, Dental Implants and invisalign. Dr. Don Mungcal is a native of the Los Angeles area and loves serving his neighbor’s dental needs. Raised in the San Fernando Valley, he completed undergrad studies at UCLA. He received his degree with honors in 1990 after completing the dental program at University of the Pacific Dental School in San Francisco. His post-graduate experience came in part from his role as a clinical instructor at USC Dental School. Within a few short years, Dr. Mungcal established his practice right in his hometown of Los Angeles. Downtown Dental has been serving patients since 1992. The love that Dr. Mungcal feels for LA seems to be reciprocal. To carry out the highest extent of dental care, his office is equipped with the latest technologies for diagnostic and restorative treatment. To gain the most accurate information, he uses 3D digital x-ray imaging, as well as intraoral photography. Same-day restorations can make your treatment incredibly convenient, and gum health can be managed with laser periodontal treatments.